On a cold, late November Wednesday in Minneapolis, Minnesota, a crowd of 7,021 arrived to the Minneapolis Auditorium to watch an NBA game between the Fort Wayne Pistons and the Minneapolis Lakers. This was a new experience for many of the fans in the stands. The NBA had formed due to a merger between rival leagues, the Basketball Association of America (BAA) and the National Basketball League (NBL), less than 16 months before. The new league was still trying to find its footing. Each game represented a chance to win – and lose – fans. This matchup boasted some of the brightest basketball stars of the day – most prominent of all, the great George Mikan. A basketball prodigy since his college days at DePaul in Chicago, he joined the Lakers in 1947 and dominated games right from the start. At six foot ten, Mikan’s rebounding, shot blocking, and killer hook shoot elevated him to becoming the signature player of the new NBA. Along with Mikan, six foot seven future Hall of Famer Vern Mikkelsen and former Stanford All-American Jim Pollard made the Minneapolis Lakers one of the most feared teams in the league. The Fort Wayne Pistons did not match up in talent to the Lakers and they knew it. But the coach of the Pistons, and Indiana Basketball Hall of Famer, Murray Mendenhall had a plan. The buzzer sounded, the clock began ticking, and the opening tip went to the Fort Wayne Pistons. As Ralph Johnson, the Pistons’ point guard, dribbled down court staring at the intimidating behemoth defensive front court of Mikan and friends, he was under direct orders from his coach. Those orders were to hold the ball. Mendenhall’s philosophy for the game was quite simple: If the Lakers never got the ball, they could never score. If they could never score, they could never win the game. As the seconds ticked by and the Pistons did nothing but pass the ball back and forth between one another, everyone not on the Pistons became frustrated. The Lakers players stood around, not knowing what to do. Occasionally they would foul simply to have a chance to get the ball back. The referees yelled at the Pistons players and at coach Mendenhall to play ball. Worst of all, the fans in the stands began to boo and stomp their feet in anger. 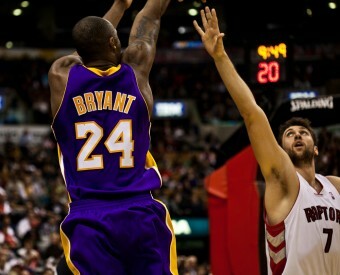 At half-time, the score was 13 to 11 in favor of the Lakers with Mikan scoring 12 of the Lakers’ points. This was the new league’s worst nightmare. The second half was even worse. The Lakers, despite being annoyed at the Pistons’ strategy, began to subscribe to the old adage “if you can’t beat ‘em, join ‘em.” Each team holding the ball for minutes at a time; the two teams only scored 13 points combined in the second half. Maurice Podoloff knew something had to be done to make sure a game of this nature never happened again. He was the man who had been put in charge to ensure the survival of the NBA and professional basketball. Podoloff was the former president of the BAA and had negotiated the merger between the BAA and the NBL to form the NBA. He was the logical choice to become the NBA president in 1949. Podoloff knew the only way this league was going to flourish was by making sure the game was fun and exciting to the people who paid his and the players’ salary – the fans. “It seems to me that the teams showed complete disregard for the interest of the fans by the type of game they played,” said Podoloff the next day. On that Friday (two days after the game), he summoned all league officials and the two referees from the infamous game to figure out ways to make the NBA game more fan-friendly. They came up with several rule changes that would be instituted in the coming year, including the widening of the key from six feet to twelve feet. They thought these changes would increase scoring and the blunt the impact of one dominant player (in this case, George Mikan). It didn’t work. Scoring was still low, fewer fans came out to the games, and teams began to fold. By the end of the 1953-1954 season, the NBA was down to nine teams. Professional basketball was very much in trouble. The owner of the Syracuse Nationals, Daniel Biasone, may have not been the first person to suggest a “shot clock,” but he was the man who convinced the NBA to use it. In 1946, Biasone paid five thousand dollars to the NBL for his Syracuse Nationals to have the right to play in the new professional basketball league. After some initial struggles, Biasone had enough of losing and paid a young player by the name of Dolph Schayes to come play in Syracuse. Schayes was a hit in Syracuse and immediately legitimized the fledgling team. The Nationals were absorbed as part of the merger and became an original NBA franchise in 1949. By 1954, the “Nats” were flat out good with Schayes leading the way, finishing with a 42-30 record and making it all the way to the NBA Finals before losing to the Lakers four games to three. As the NBA and the Nationals entered the 1954-1955 season, there was fear that this may be professional basketball’s last hurrah, exemplified by The New York Times writing that “professional basketball’s existence was in jeopardy.” None of the rule changes meant to increase scoring and make the game more fan-friendly had worked. But Biasone had an idea. He had watched and studied hundreds of basketball games since his Nats joined the league over eight years ago. After much thought, he determined that a “well-balanced” game meant that each team took 60 shots a game, or 120 total shots in a game. Each game was 48 minutes, or 2880 seconds, long. Using basic math, Biasone divided 2880 seconds by 120 shots and got a magic number – 24. According to this formula, a well-balanced game required a shot every 24 seconds. Therefore, a clock counting down from 24 seconds would force teams to shoot in this amount of time or less, creating a much more exciting and fun game. Now, Biasone needed to convince Podoloff and the rest of the NBA that his 24 second shot clock would be solution to their scoring problem. He experimented with it during National’s exhibition games and it had the necessary impact on scoring that the NBA adopted for the 1954-1955 regular season. On October 30th, 1954, in a game between the Rochester Royals and the Boston Celtics, the shot clock officially debuted. It was a rousing success with the Royals defeating the Celtics 98 to 95. Daniel Biasone and his 24 second shot clock had saved professional basketball. The twenty-four-second rule has worked so well that I firmly believe it has proved the salvation of professional basketball. So far this year attendance receipts at our games have increased 57 percent… The adoption of the clock (has been) most important event in the NBA. Today, a monument, an actual shot clock that counts down from 24, stands in downtown Syracuse, New York commemorating the impact Daniel Biasone and his shot clock had in saving the game of basketball. George Mikan is considered to be the first superstar of the NBA. Nicknamed “Mr. Basketball,” he led his teams to seven championships, won three scoring titles, and was so dominant rules were named after him, including the widening of the lane from six to twelve feet — “the Mikan Rule.” Always wearing his trademark thick round glasses, he played eleven seasons and was voted in 1950 “The Greatest Basketball Player of the First Half Century.” He had a huge impact on the game even after his retirement in 1956. He was the first commissioner of the revolutionary ABA in the late 1960s, helped bring professional basketball back to Minnesota in 1990, and fought the NBA to increase pensions for retired players who played during the league’s early years. George Mikan passed away in 2005 at the age of 80. The NCAA did not introduce a shot clock into the men’s college game until 1985. Women’s college games had been using a 30 second shot clock since 1970, but there was a fear in men’s games that smaller college teams would not be able to run and keep up with the bigger schools. Because of this, “killing the ball” was a huge problem in men’s college basketball for many years. In 1973, a game between Tennessee and Temple ended in an 11 to 6 score with fans throwing ice onto the court in disgust. Dean Smith, the legendary North Carolina coach who coached Michael Jordan, James Worthy, and many other greats, had a stall offense he called the “four corners.” Only 30 years later, in 1985, did they rectify this by installing a 45 second shot clock. In 1993, they reduced the shot clock to 35 seconds. In 1955, the same year Biasone brought the 24 second shot clock to the NBA, the Syracuse Nationals, coincidentally, won their first and only NBA championship. With Dolph Schayes leading the way, they defeated the Fort Wayne Pistons four games to three. Over the next eight seasons, the Syracuse Nationals remained respectable and out lasted many of the other smaller town teams in the NBA. By 1960, the Nats were the last remaining old NBL team still playing in their original city. On March 26th, 1963, the Nats lost in overtime to the Cincinnati Royals (formerly the Rochester Royals) by the score of 131 to 127, knocking them out of the playoffs. That was the last professional basketball game to be played in Syracuse. That year, Biasone sold the team to an investment group who promptly moved them to Philadelphia before the start of the next season, renaming the team the 76ers. As a Freshman in HS basketball I got the “pleasure” of watching the Varsity team play a game similar to this against a team perceived to be better. The coach had a plan and within seconds everybody saw what it was; he instructed the players to play the four corners offense for the WHOLE GAME. They won the final score being an anemic 16 to 12. The players were razzed on the court and in school for merely following the coach’s direction. How can you write a historical article and fail to include the year the headline event occurred? What a massive failure of journalism.